I've re-read this book for doing a comparison with The White Sheik by Fellini in my school essay, so after studying it at school and analyzing it for what was necessary in the comparison it occured that surely the read has not been as intense as before. I had a memory of me reading it at 13 with a more involved disposition, ignoring the developing of the plot and not being aware of the entire psychology and issues of Madame Bovary. There was even something comic in this last read, maybe because not only Charles, but Emma too is a poor soul, and in addition incapable of living without something which is not a childish expectation towards life and people. I don't hate her like many others: yes, she worries only about herself, she's selfish, vain, and so on, but..something stops me from hating her, maybe because at the end of the fair she obtains nothing. I'm very sorry for Berthe anyway: what a miserable fate. 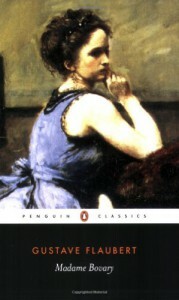 I've had the chance to appreciate more Flaubert's style: a master! I'm eager to read Sentimental Education.